Size: 6.5" x 4.5" x 1.1"
The TI-EC7 Pro+ replaced in 2007 the TI-EC7 Pro introduced only one year earlier. We have recently become aware of a computational issue with the EC-7 calculator. 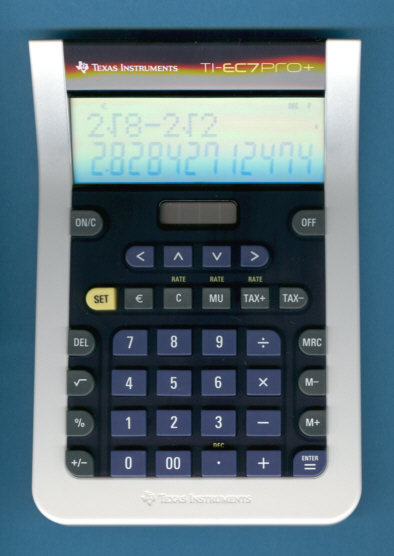 This does not affect the EC-3 or EC-5 models, or any of TI’s other calculators. When inputting figures less than 1.0 on the EC-7, you must input a zero before the decimal. Otherwise the answer will be incorrect. For example, in the EC-7 100 – .5-.5 = 100; 100- 0.5-0.5 = 99. Dismantling the TI-EC7 Pro+ reveals a printed circuit board (PCB) 100% identical with the TI-EC7 Pro and we assume that the fault was corrected by a software update of the single-chip calculator circuit hidden under the small black epoxy-resin blob. © Joerg Woerner, August 12, 2007. No reprints without written permission.